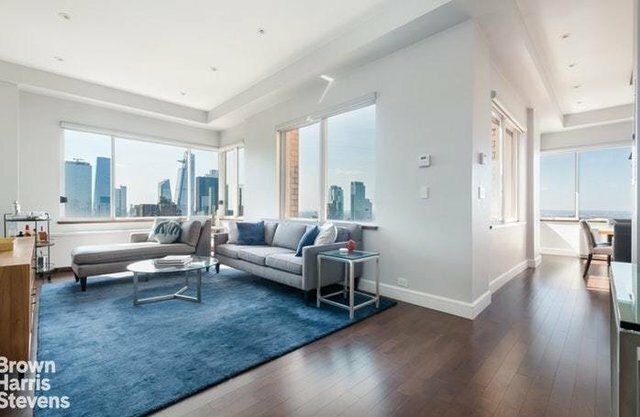 On the top floor of Two Worldwide Plaza sits a gorgeous 39th floor Penthouse, with soaring southwest exposure framing views of Hudson Yards, One World Trade, the Empire State Building, the Hudson River and beyond. One of only four apartments on the floor, this 2-bedroom, 2.5 bath home was completely renovated in 2016 and is in immaculate condition. From your peaceful perch overlooking Manhattan, entertain and relax in a true eat-in chef's kitchen, fitted with a Subzero fridge, a Marvel wine fridge, a Bertazzoni Stove and convection oven, a Miele dishwasher and completed with a large "chef's table." A split bedroom layout offers maximum privacy, while the corner living room and windowed-kitchen bring in sunlight all day. The master bedroom features a walk-through dressing area and a luxurious ensuite master bath. The bathrooms and powder room have been uniformly renovated with great attention to detail, completing this mint residence. Further, this apartment is distinguished by 10' ceilings, new hardwood strip flooring, excellent closet storage, and an in-home washer and dryer. The apartment is equipped with Hunter Douglas automated window treatments throughout with blackout shades in the bedroom. Worldwide Plaza is a full-service condominium with 455 units on 39-stories with a 24 doorman and a concierge. Residents of the building enjoy the TMPL GYM by David Barton, additional laundry rooms per floor and a private garden courtyard. The onsite garage operates 24 hours a day, provides valet services and offers competitive monthly rates. This convenient location offers superb access to subways, restaurants, Broadway shows, and more, while offering the quiet of home as you step into the lobby.